It’s almost the weekend, which means it’s time to make weekend plans. Living on an urban campus in a city like Pittsburgh, students have what feels like a limitless variety of options to choose from. There are numerous places to eat out with a group of friends, and this weekend alone, a popular band could be coming to town, or a new blockbuster might be coming out. But planning a fun weekend isn’t usually the problem — in fact, it’s not a concern at all. More likely, a student’s problem is money — or rather the lack of it. Alexandria Dsouza, an international student from India who also works at Market Central, echoes the concerns of many students when she expresses her apprehension about money. Student life is already stressful enough without worrying about how to come up with the money to enjoy the weekends — time that’s meant as an escape from the pressures of academia. One solution to the money problem is simply to lead a thriftier lifestyle. Following a few simple rules can help alleviate unnecessary economic headaches. The first rule is obvious — thrift by buying used items. You can find cheap clothing, textbooks and furniture at Goodwill, Salvation Army or online. Craigslist or Facebook are good for online shopping for anything from a classmate’s old textbook to a new bed set. “Free & for Sale: Oakland” and “Pitt Textbook Exchange” are particularly useful Facebook pages for Pitt students to find cheap goods. 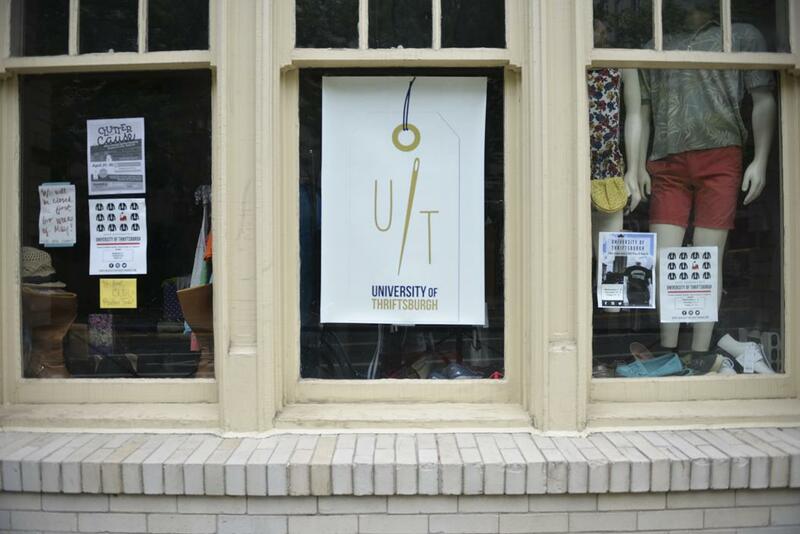 Offline, Pitt also has its very own campus thrift store — cleverly named the University of Thriftsburgh. Ruby Walker, a junior social work and English writing major, said that she often finds things at Thriftsburgh without meaning to. Pitt also supplies students with an avenue to receive cheap food through the Pitt Pantry, a food pantry specifically created for the Pitt community. Beyond food, the pantry also offers coupons and toiletries to students who earn less than 150 percent of the federal poverty line — about $18,000 for a single person household. Madoc Smith, a Pitt Pantry volunteer and junior studying mathematical biology, computer science and urban studies, explained the multi-disciplinary approach that the Pitt Pantry uses to reduce food insecurity on campus. The Pitt Pantry also pushes students to coupon for themselves. Minimalist living can reduce costs, but there are also some items — mainly items concerning personal hygiene — that are necessities. It’s great to have coupons for things like soap or toothpaste in order to save a few bucks. Unfortunately, free food alone can’t sustain students, and, at some point, buying food is necessary. Grocery shopping on a limited budget is possible if the shopper makes smart food decisions. Just because a food item is generic doesn’t mean it’s any less filling than the more expensive name brands. Money-concerned students are much happier after acquiring a taste for the beverages and foods that their wallets can afford. Aldi, a German-born grocery store, is a particularly good place to find cheap store-brand food items with easily accessible locations in East Liberty and the South Side. Although spending money is against the thrifting way, the cheapest spending vehicle is through cash. When going out, frugal students only take cash that they’re willing to spend and leave credit cards at home. Spending $150 at Hem’s or buying five Antoon’s pizzas in one night won’t look great to parents, the bank or a credit score. Thankfully, the Pittsburgh community often aids thrifty living by offering student discounts. Entrance to the Andy Warhol Museum, the Carnegie Museum of Art and Natural History, the Carnegie Science Center, Phipps Conservatory and Botanical Gardens, Senator John Heinz History Center and Soldiers and Sailors Memorial Hall and Museum are all free with a Pitt ID during the academic year. It also never hurts to ask retail stores if they offer a discount to students — Q’doba, Goodwill and the Pittsburgh Opera are just a few examples of businesses that offer reduced prices to students. A Pitt ID is additionally useful for cheap transportation. Uber, Lyft, Sidecar, Curb and Hailo are not necessary apps for Pitt students since transportation cost is included in tuition. Smart spenders take advantage of the free bus fare that comes with a Pitt ID — many of the busiest bus lines in Pittsburgh, including all the 61 and 71 lines, pass through Oakland. However, sometimes it can be hard to avoid hopping in an Uber late at night after the busses stop running. Economical living opens up a world of possibilities to students who feel restricted by their empty bank accounts. Living a cost-effective day-to-day ensures that Pitt students can have spending money that is necessary to fully appreciate both Pittsburgh and the Pitt community.